Make Your Voice Count - It's Easy! Got a FEDERAL issue you care deeply about? Here are some cool links to your representatives in Congress! Right to Privacy Clause in danger! The Constitutional Revision Commission (CRC) is considering Proposal #22 aims to gut Florida's very strong Constitutional privacy right so that it applies exclusively to personal information — as in documentary records — and not to personal privacy. If this proposal passes in the Commission and passes on the ballot in November, it will take away from judges the tool they have used to defend Florida citizens against state intrusion into a wide swath of privacies, the most important of which is reproductive freedom. The Judicial Committee will be meeting this Thursday, Feb. 1 at 1 PM. Please contact theJudicial Committee and ask that they vote no on Proposal 22. Feel free to use the talking points provided below to aid you in your message. Commissioner William "Bill" Schifino, Jr. In trying to circumvent court rulings protecting Florida women’s right to self-determination about their medical care, proponents of Proposal 22 have created something that is unnecessary, would not achieve some of its intended effects, and would have drastic unintended consequences. Proponents of Proposal 22 have argued it is necessary to ensure parents are notified when a minor is attempting to seek an abortion – but the U.S. Supreme Court has held that parental consent is constitutional so long as there is a confidential judicial bypass system. These rulings did not implicate Florida’s constitutional privacy right, and in any case, Florida already has a parental consent law. Florida’s constitutional guarantee of a right of privacy has protected Floridians’ private lives from a broad array of government intrusions. The Florida Supreme Court has long held that it “embraces more privacy interests, and extends more protection… than does the Federal Constitution.” Throwing all of that out to try to run around past state court decisions will not change the fact that the U.S. Supreme Court has held that women have a right to an abortion. 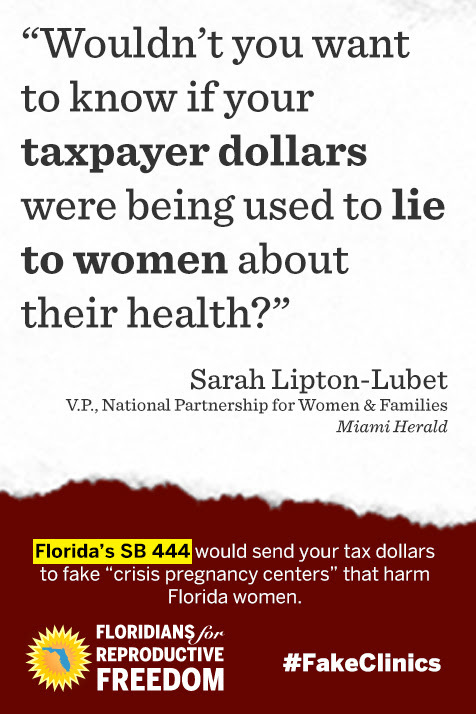 It is imperative that those who believe in reproductive rights reach out to Senators now to advocate against passage of SB 444 -- the bill that legitimizes Crisis Pregnancy Centers posing as fake clinics to keep women from accessing abortion care. The CPC bill will be heard in the Senate Appropriations Committee this Thursday, January 18 at 4 PM. This is the bill's last stop before heading to the Senate floor for a vote! Its companion bill has already passed in the House. Before Thursday, please call as many of the members as possible, starting from the top of the list. Their offices must be flooded with your calls, whether answered by staff or voicemail. Senate Bill 444 would make permanent a program that funds so-called Crisis Pregnancy Centers (CPCs), most often run by organizations opposed to abortion -- not medical professionals. CPCs have been known to use medically inaccurate or incomplete information and intimidation tactics to dissuade women from obtaining abortions. CPCs intentionally withhold essential, sometimes life-saving, reproductive health information from women who are tricked into thinking they are visiting an objective medical facility. There are more than 120 such entities in Florida. We are not questioning their right to exist, but we oppose CPCs receiving state funding or state credentialing. For more information on CPCs, view this 18-minute exposé by Vice News. What’s worse, although CPCs oppose abortion and contraception -- and therefore will not provide comprehensive counseling or referrals -- their advertising and outward appearances are frequently calculated to deceive women into believing they will be able to access a full range of reproductive health care services. Interested in getting more involved with reproductive rights? Join the Florida League’s statewide Reproductive Health & Justice Action Team. Complete this form to be added to our email group and to receive dial in instructions for our monthly conference calls. TALLAHASSEE, Dec. 13, 2017 Last week, we asked you to make phone calls and send emails to stop three bad gun bills that were being heard in committee. All of that work from our members paid off big time for gun safety in our state. All three bills were voted down in committee! Senators Anitere Flores and Rene Garcia of Miami reached across the aisle and helped take these bad bills down in a bipartisan manner. We need you to take 10 minutes of your time to make phone calls and send emails to stop some dangerous gun bills that are making their way through the process on both the state and federal level. Thank you for supporting gun safety in our state! ICYMI: The petition that would place an amendment to restore voting rights to formerly incarcerated individuals on the 2018 ballot is entering the home stretch. We are now less than 100,000 away from our goal of 1,000,000! The deadline is quickly approaching and this is the last push to get signatures. If you haven't signed yet, download the form and do so. If your friends and family are registered voters and have not signed the petition, download the form and get them to sign it! If you want to volunteer with your local League to get petitions signed, let us know! Our time is NOW. Summit is already only 2 months away! Join us in Tallahassee on Feb. 6 and 7 as we take over the Capitol and lobby on our issues. This is the highlight of our year, and it is not possible without you! Sign up to meet with your legislators, hear from lawmakers in the process, learn how to lobby them, and mingle with your fellow League members at our annual Gala! Stay tuned for much more info. Click here to register! Want to be a part of shaping the future of LWVUS? Sign up for 2018 Convention in the Windy City! 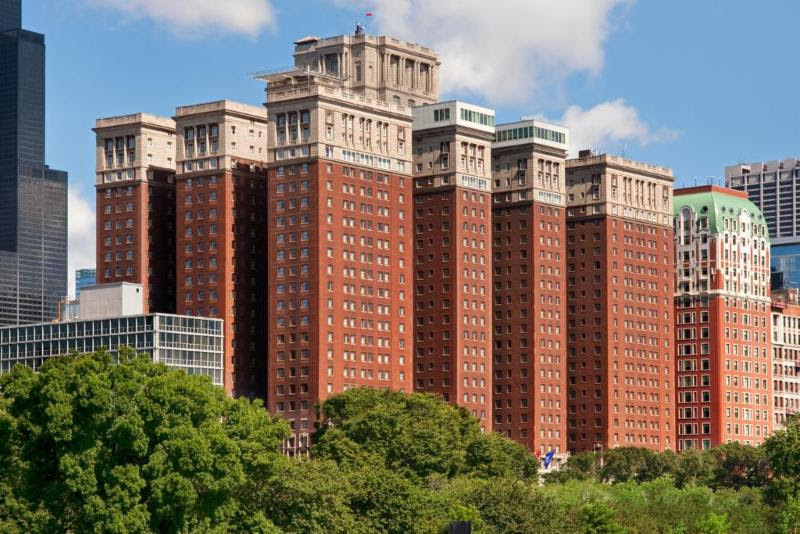 Convention will be held at the Hilton Chicago from June 28 to July 1, 2018. Meet with Leaguers from all across the country as we make sure that Florida's voice is heard for the upcoming biennium. State Rep. Joseph Geller (D-Adventura) has filed HB 367 which, if passed, would allow Florida to join the states that have already enacted the National Popular Vote Interstate Compact. The Compact is designed to ensure election of the President and Vice President of the United States by popular vote. Important News!!! 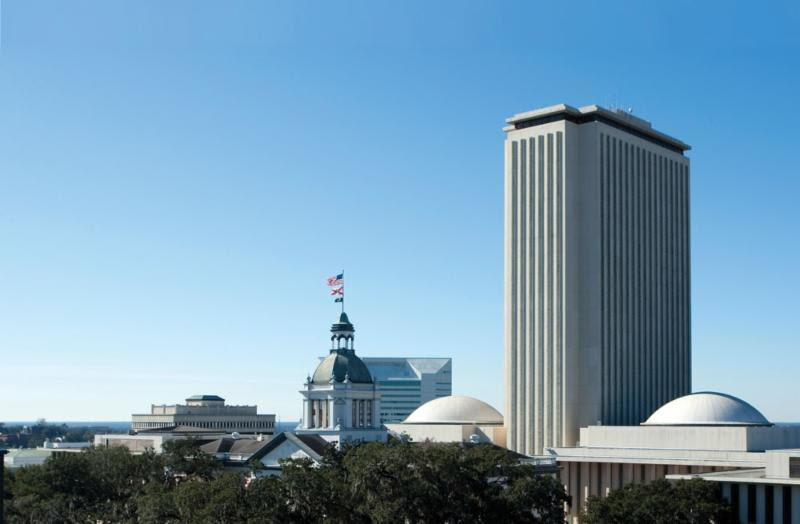 The League and Florida Rights Restoration Coalition (FRRC) and other lead partners have crafted a formal partnership to tackle obtaining signatures for Petitions for an Amendment to Reinstate Ex-Felon's Rights and to manage the state-wide campaign. The League role will be to participate in the leadership of the partnership and to educate the public about this important matter and to obtain signatures on the petitions. There will be a several step process. First, Each league should designate a point person in their league to chair their Reinstatement of Rights efforts. 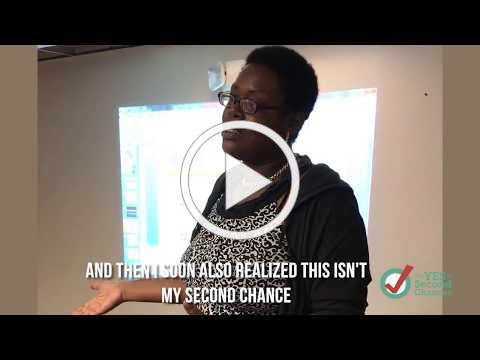 Do you know of anyone in our community who has lost their right to vote in this way? How has it affected them? Do you have a personal experience to share? We'd like to hear from you!